Powered by Atlassian and working for your customers – and your team – JIRA Service desk builds on ten years of JIRA innovation and solid marketplace testing to provide a robust and productive advanced service desk capability. Tap into the Atlassian’s automated and customisable approach to customer service management – the perfect add-on to enhance the productivity of your IT service team. Atlassian Experts Design Industries have been recommending JIRA Service Desk since it first came onto the market. When we work customers to implement JIRA Service Desk, the results always exceed expectations. Michael Dockery, who co-founded DI with Pascua, will be speaking about JIRA Service Desk at a one day event on 28 August in Melbourne, hosted by DI and providing insights and inspiration for implementing JIRA Service Desk in your organisation. JIRA Service Desk is specifically designed to remove the communication disconnect between customers and service teams. For your customers, asking for help is as easy as it’s ever been (perhaps even easier!) 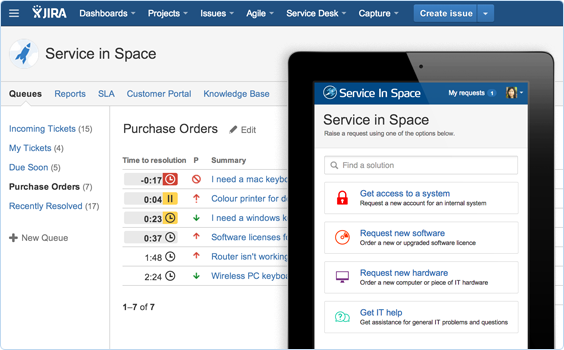 The JIRA Service Desk enables plain language intuitive service requests. JIRA Service Desk also provides links to recommended, related knowledgebase articles – for self service options that will free up your queues and satisfy your customers even more quickly. Customer service agents – meanwhile – are able to view, prioritise and manage tasks in a way that makes their job easier. Getting the request in front of the right team member – and answered efficiently – is now standard practice. Forget cumbersome manual triage and prioritisation. Even the most efficient service desk is overwhelmed by service requests sometimes. JIRA’s automated task prioritisation ensures your task assignment and response times are better than ever. Tasks are assigned in real time to queues that align with your SLAs. And your SLAs are fully reportable. With advanced SLA metrics straight out of the box, or customised to your business with the help of a team of JIRA Service Desk experts. Are you ready to take your service desk to the next level? Register for our 1 day event on 28 August to find out about using JIRA Service Desk for higher customer satisfaction, seamless task prioritisation and effective SLA management. You might just find that adding JIRA Service Desk to your organisation’s toolkit is the best way to move past the trends and bottlenecks that have been holding you back. Nobody does Jira support like Design Industries does it. We’re Australia’s leading consultants for Atlassian technologies, and when you need Jira Service Desk implentation services, we’re right here for you, 100 percent of the time. Your team are the experts in providing support for your product, and we’re the experts in providing support for your team. It probably isn’t reasonable to expect a member of your team to be an expert in your own technology and also a Jira expert as well. Fortunately that isn’t necessary, because you can count on support from Design Industries. Our specialist Jira consultant will get you set up with your Jira helpdesk solution in almost no time at all, and once it’s done, if you have any problems at all, our own Jira helpdesk is just a couple of clicks away. So even if you’re just gettins started with Jira, help is at hand, and that’s always good to know. We take all the difficulty out of setting up your Jira Service Desk, so you can focus on continuing to provide great service to your own clients. There will always be situations where a client needs some kind of custom solution for a specific situation, and we have an expert Jira consultant on standby ready to help you at a moment’s notice. We’re not just determined to be the best in Jira support, whatever needs you have, we likely already have or will quickly develop the solutions to meet your needs. Did we mention frustration? We save you from that too. There is no problem you might face with your Jira Service Desk or main Jira implentation that we would not be able to fix for you. Best of all, because we have expert Jira consultants on tap, that means you get faster solutions and it costs you less, because we minimize your downtime. More uptime means greater productivity and more efficiency. You’ll be delivering the best solutions for your products, secure in the knowledge you have us ready to help if you encounter any trouble in the process. It’s so good, we use it ourselves. That means when you contact us for Jira support, we’re using the same software you are. You will get the most timely solutions when you contact Design Industries for Jira help. Put your trust in us and you will not be disappointed. Our Jira consultants are the best resource to help you get the most from your Jira Service Desk implementation. Call us now to find out more about the many other services we can provide your business with. Need some help with your Jira Service Desk implementation? We are Design Industries, the support team that supports your support team. Throughout Australia, we work with companies and organizations of all sizes in every imaginable industry sector, helping them get more from their Jira Service Desk software. If you’re in the support business, you already know the value of good tech support. You also know your team can do its best work by dedicating as much as possible to supporting your clients. That’s why Design Industries is the perfect support partner to provide support to your team. We free them up to do what they do best by concentrating our efforts on what we do best. When you engage Design Industries to be your Jira support contractor, you’re not just getting a consultant, you’re getting a dedicated solutions partner. We will configure and implement your Jira Service Desk software correctly from the very start, on a bespoke basis perfectly tailored to the needs of your individual organization. From then on, you can count on us to continue to provide all the support you need to ensure your software is always performing optimally. If there’s any problem at all, you can contact us and we’ll solve it. We can also provide training to your staff in the best ways to get the best out of Jira Service Desk, so in every way implementing this software into your business is going to provide significant positive returns in terms of boosted performance and better business cognition. One of the most frequently criticized factors in technology based products is the quality of the technical support customers receive. With Jira Service Desk implemented to perfection by Design Industries, your team will be able to provide top notch support; an attribute that can help you stand out from competitors. You get the competitive edge by being able to provide more timely and more accurate support responses. That can mean better reviews, more positive feedback, and even improved sales performance. Customers are attracted to products that are well supported. They can be even more easily dissuaded from investing in products that are poorly supported. It does matter. In fact, it has never mattered more, because we live in an age of social media where opinions can spread like wildfire, and those opinions can often be highly influential. You want positive impressions to far outweigh negative impressions, and one of the best ways to cut down on negative impressions is to provide truly impressive technical support services to your customers. Let Jira help you take this vision and turn it into reality. It’s easier than you probably expect, and the results are worth it. Making it even easier is expert help from Design Industries, the experts in Jira Service Desk implementation in Australia. Call today and find out more about how we can assist you to build and maintain the best possible technical support system with Jira Service Desk. Design Industries are an Atlassian Platinum Solution Partner that offers premium Atlassian support. We also offer a high level of Jira support & confluence software support. Atlassian Summit 2014 – what’s making mouths water at DI?